In two weeks digital and technology leads from across government will come together at Sprint 16, assessing progress over the last year and setting future priorities. In the run-up, I’ve been thinking about our own progress at the Department of Health. Here’s some highlights for me against our top objectives, along with some thoughts on what next. Health services that meet the needs of their users, saving time and money and leading to a more sustainable health and care system. This was an area where we played a bigger role last year, following the commitment in “Personalised Health and Care 2020” to set up a “digital support service” to promote the transformation of national health and care services. The challenge was where our small team should start. We analysed the current situation - for example, thousands of websites - around 3000 - on the NHS.UK domain, low take up of many online services, and in some case no services at all (e.g. universally registering with a GP). Many services seemed to reflect our complicated structures, rather than the needs of patients and front-line staff. We set as our first priority some projects that could showcase the power of a more user focused service design approach. Working jointly with NHS England, we set up “the NHS.UK alpha” - a cross system team to develop the future vision of NHS.UK, the central health and care website. In its first 12 weeks - through developing a deep understanding of patient and front line needs, building and testing prototypes, and talking to over 200 people across health and care - the team identified real opportunities to reduce unnecessary demand on services, to improve efficiency, and to improve quality. We also launched the “Having a Baby” project, on how to improve online services for mothers, their partners and front line staff. The conclusions have fed into the NHS Maternity Review and will be publicly available so anyone can draw on them. And we increased our support to other projects, helping teams scope their work and the capabilities they needed (e.g. NHS jobs and Healthy Start). This has been about helping projects start right, building on the £156m saved through the digital and technology spending controls in 2014/15. We also held sessions with our arms length bodies to build digital capability and share knowledge, and continued to improve our own internal services (e.g. our cost saving, highly rated intranet). Communications that are clearer, more targeted around the people they affect, and designed with insight and data. We looked at how to further innovate our engagement with people affected by or interested in our policies and are now applying a new approach – a new campaigns platform, better visual content, easier ways to subscribe to updates, and better insight so we have more of an ongoing relationship with our audience. We also improved our ability to produce multimedia content. Our information messaging on ebola contributed to a Chartered Institute of Public Relations Excellence Award. 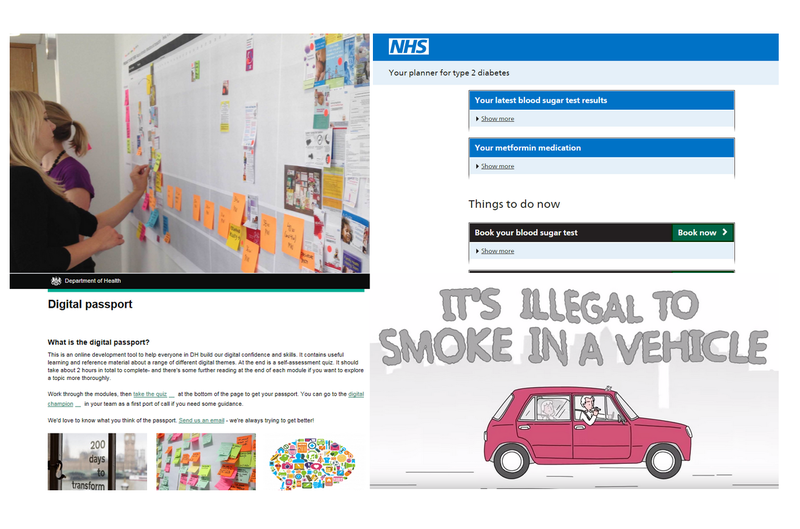 Our low cost animation on smoking in cars has received around 3 million views and drove the most ever visited health page on GOV.UK. This was on top of publishing 3500 items on GOV.UK and supporting 40 consultations. We provided guidance for policy makers on how to carry out good consultations and new training on plain English to improve the quality and accessibility of what we publish. Policy making that is more open and better informed and can take advantage of new technology to drive better public services. We worked on a number of capability challenges. First, ensuring every policy officer has a basic level of digital understanding to help them in their jobs. We developed a “Digital Passport” giving that basic grounding and also launched a second wave of “Digital Champions” to help teams better explore digital approaches. This year’s survey showed 62% of staff routinely using digital skills in their work. Second, encouraging and supporting those wanting to innovate. We held “Thought Leader” seminars (e.g. on the possibilities from data visualisation and on social media analysis). We combined this with a digital “Dragons’ Den” supporting teams to deliver their innovative ideas - a number of those projects are now underway. providing the right support to and assurance of - what will be a major programme of - digital and technology projects, so they succeed and meet government standards. I’d be interested in your views on how we can take full advantage of the opportunities ahead.